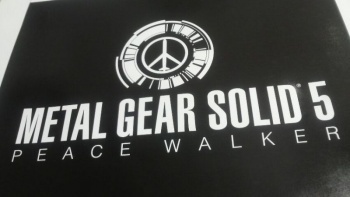 Hideo Kojima's upcoming PSP stealth action title Metal Gear Solid: Peace Walker was indeed originally meant to be a proper, numbered Metal Gear Solid 5. We already knew that legendary Japanese crazy man Hideo Kojima was spending most of his time and attention on developing Metal Gear Solid: Peace Walker. We already knew that the man considers it an "MGS5-class game." What we didn't already know is that in early development, the PSP action title was Metal Gear Solid 5. A Japanese Konami blog entry shows off some early prototype logos for the handheld adventures of Big Boss, and it's there plain as day: The original title of the game was Metal Gear Solid 5: Peace Walker. Every game in the "main" series since MGS2 has had a subtitle (Sons of Liberty, Snake Eater, and Guns of the Patriots) so the "Peace Walker" bit now makes slightly more sense. Now, the question becomes: Why was the title changed? If Peace Walker is an "MGS5-class game," why isn't it Metal Gear Solid 5 anymore?